Is 3M Healthy Enough to Invest In? The company isn't going anywhere, that's for sure. But there's one yellow flag you need to know about before you buy in. The best linebacker on earth can still find himself sidelined by a microscopic flu virus. The same is true for companies: Even the biggest and strongest can be brought to their knees if they don't stay financially healthy. 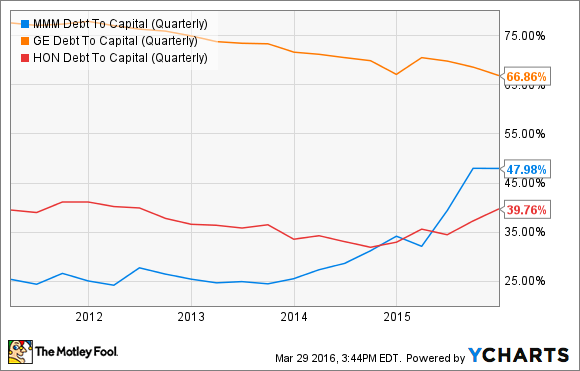 Nobody can argue that 3M (NYSE:MMM) isn't both big and strong. A member of the Dow Jones Industrial Average and one of the largest conglomerates in the United States, the company also benefits from a lack of large competitors and a recognizable brand. In these ways, it's similar to its peers, General Electric (NYSE:GE) and Honeywell International (NYSE:HON). But if its balance sheet isn't healthy enough, it simply may not be worth the investment. One major factor in determining financial health is to see whether the company is profitable. Of course, in some cases -- especially in the tech sector -- a healthy company may not necessarily be profitable. Amazon is a famous example.But for a mature, traditional company like 3M, lack of profitability would be a huge red flag. 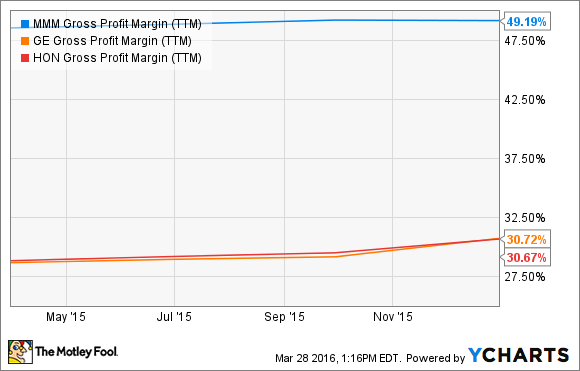 MMM Gross Profit Margin (TTM) data by YCharts. 3M's net profit margins are similarly outstanding: 16%, compared to 12.4% for Honeywell and just 5.1% for GE (although GE's low profit margin is a bit misleading: It's nosedived since the company began its restructuring efforts in early 2015). One thing's for sure, though: 3M's margins are best-in-class. 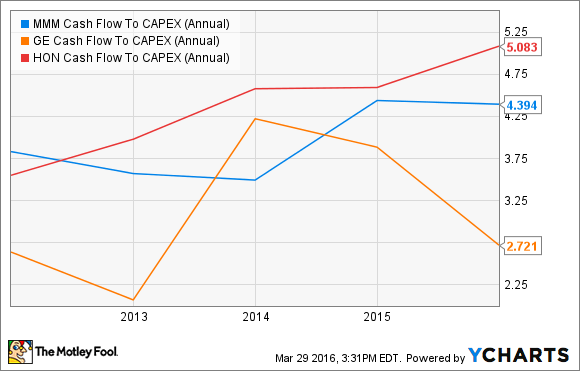 MMM Cash Flow To CAPEX (Annual) data by YCharts. While GE's number has bounced around, Honeywell's and 3M's have been steadier, and generally on an upward trajectory -- which is good. That means the companies are generating more and more cash relative to their capital expenditures. MMM Debt To Capital (Quarterly) data by YCharts. Uh oh. Here's the first sign of trouble for 3M: Its debt-to-capital ratio has increased significantly over the past year as it has taken on long-term debt to finance share buybacks and its dividend. MMM Net Total Long Term Debt (Quarterly) data by YCharts. This isn't necessarily a bad thing. Taking advantage of low interest rates can be a sensible move, particularly if a company can deploy the cash effectively. 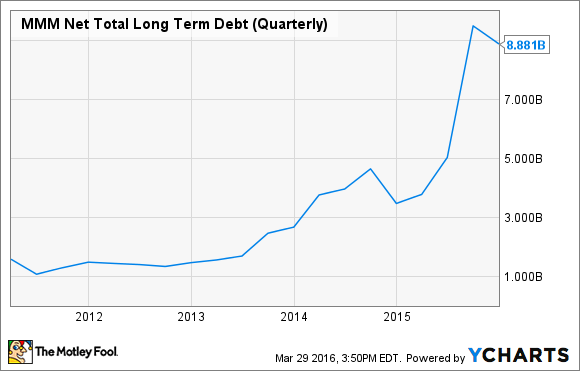 What should give you pause, though, is that 3M isn't showing any signs of letting up on its debt financing. In early February, the company announced a dividend increase and up to $10 billion in share buybacks. But at the end of 2015, it only had $1.8 billion in cash on hand. So if those buybacks occur this year, they would need to be financed through additional debt, even as interest rates are rising. And with a current P/E ratio of more than 21 -- higher than Honeywell's 18.7 and GE's 16.8 -- it's hard to see how 3M shares are any kind of a bargain. Now, just because the board has approved $10 billion in buybacks doesn't mean the company will necessarily follow through immediately (it could, for example, space them out over several years or decline to purchase the full amount altogether), but it's clearly something you should keep an eye on. 3M is certainly a profitable company that generates sufficient cash to fund its operations and its capital needs. Investors should still be concerned about its comparatively high long-term debt load coupled with its plans to buy back more shares. While this isn't enough reason to sell or avoid the stock in and of itself, it's definitely worth watching. You may want to wait to see how management proceeds before buying in. A short-term pop in stock price due to share buybacks isn't worth years of struggles with higher interest payments. John has found investing to be more interesting and profitable than collectible trading card games. He seeks growth and value stocks in the U.S., in Germany, and beyond!